With a unique offset, curvaceous shape, the original Jazzmaster guitars were designed with jazz players in mind, often known for playing while sitting down, too. The Jazzmaster has a well-revered rich, beefy tone and is versatile enough now to suit a wider range of genres aside from blues and jazz. The American Professional Jazzmaster draws on plenty of classic influences and blends them together with some new appointments, attracting many a modern guitarist. The Jazzmaster has been fitted with a smooth 25.5-inch scale length maple neck. 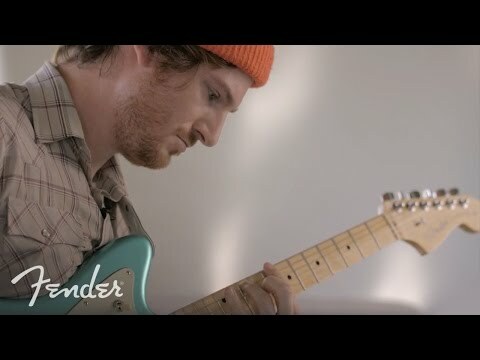 For the American Professional Jazzmaster, Fender have redesigned the neck by employing a new Modern "Deep C" profile for the best possible playing feel in your hand. The Jazzmaster was the first Fender guitar to use rosewood for the fingerboard, and this is the same luxurious tonewood used in the American Professional's fingerboard. This beautiful playing surface has a 9.5-inch radius and is decorated with white dot inlays. The fingerboard is home to 22 narrow-tall frets which allow for effortless string bends and chord formations to be explored. This powerful American Professional model is kitted out with the brand-new V-Mod Jazzmaster single-coil pickups, courtesy of the legendary Michael Frank who is well-known for designing the Eric Johnson Signature Stratocaster pickups. These soap bar-style single-coils are packed with a punch, producing beautifully versatile, vintage Jazzmaster tones. A hugely important component of the American Pro Jazzmaster that gives it that unparalleled sustain and intonation is the bridge. Fender have fitted a 9.5-inch radius Jazzmaster/Jaguar bridge with brass Mustang saddles to the lower bout of the body, with a vintage-style floating tremolo, tremolo lock button and a screw-in tremolo arm. The tremolo lock button, along with a bone nut and dependable Fender standard cast/sealed staggered tuning machines ensure that your strings always remain firmly in tune, even after heavy use of the tremolo arm. The striking body is complemented by a 3-ply pickguard, white "witch hat" control knobs and nickel/chrome hardware. Fender include an Elite moulded case with each American Professional Jazzmaster guitar.